When political activism is triggered by falsehoods, what do we do? 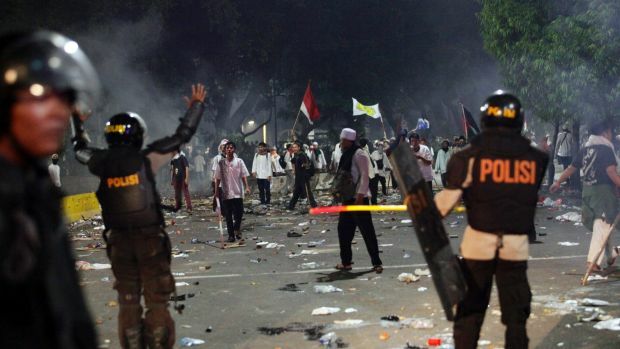 I was curious about the alleged blasphemy which had been reported as triggering violent protest in Indonesia – none of our local news services cited the inflammatory words. I wondered whether it was extreme sensitivity to allegations of anti-Muslim bias which led the newspaper and TV reports I came across to avoid dealing with the misinterpretation of sacred words as a basis for violence. If so, it is a pity – much of the world’s politics is shaped by invincible ignorance or deliberate lies, and we really need some mechanism for dealing with that. This is a serious topic which has not been addressed by our parties’ policies. It is time we wrote to our representatives and called for legislative action to protect the ignorant from falsehoods in the political arena as well as in the commercial world. Maybe even time to picket or pillory those who are caught out misleading the public. If they should have known better, if they could have checked with reputable experts, if they chose to speak from ignorance while acting as demagogues – they are as culpable as if they had lied. In this case it is worse than usual, as the protests could be used by those already nervously aware of the Koran’s approach to those who are not of the Christian or Jewish faiths (why not to be an active atheist or pagan in Indonesia or Dubai…) to fear that Muslims could be led to vote for radical candidates purely on the basis of their faith, and thus destabilise our political system.